A lot of announcements were made at San Diego Comic-Con this past weekend, but probably one of the subtlest yet best came from DC with their announcement that the next solo Green-Lantern movie would be a Green Lantern Corps. movie. Green Lantern is one of DC’s biggest heroes and it was a disaster when the 2011 movie featuring Ryan Reynolds crashed and burned. With the complete reboot of the DCMU in progress, Green Lantern is something that DC needs to get right; they have Batman, Superman, Woder Woman, Aquaman, Cyborg, and The Flash all cast, but no Hal Jordan. I think that this clearly shows DC and Warner Bros. are taking their time with the property to make sure it is the big hit it should be. Green Lantern is a cool sci-fi property and having the movie be about the entire corps. could set it in space and have a similar feel to Guardians of the Galaxy. The Green Lantern canon is old and rich, filled with plenty of amazing characters and deep stories. The coolest thing about this movie is that we are guaranteed to get more than one Green Lantern. Although Hal Jordan is the most known Lantern figure, there have been multiple characters that put on the ring. In the past, other fan favorite Green Lanterns have emerged aside Hal which gives a pretty good guess of who will show up in the movie. Behind Hal, the second most popular Green Lantern is easily John Stewart. I think that there is no question Stewart is a part of the Corps. film. A lot of people were hoping that Arrow’s John Diggle would somehow become John Stewart Green Lantern, but it looks like the big screen will incorporate the character instead. There is a chance that this first movie only features Hal and John, but if DC is smart, they will use the Green Lantern Corps. movie to cast two other big Lantern roles; Kyle Rayner and Guy Gardner. Rayner steps in after Jordan and Stewart but does a great job as well because he can overcome fear very easily and has a personality to match it. Guy Gardner is a big fan favorite who gives off more of a greaser/punk vibe from his attire. Gardner had an abusive alcoholic dad and an overall rough upbringing and was one of the two people (the other being Hal Jordan) chosen by the ring of Abin Sur to become the next Green Lantern. Jordan got there first but later on Gardner becomes a Lantern as well. These four characters are all staples in the DC comics universe and Warner Bros. has yet another chance to take golden material and bring it to life. Each of these Latnern characters are unique in their own way and all have great stories to be told. While I would still like the main focus to be on Hal Jordan, I think that quickly incorporating a Green Lantern Corps. motion picture opens up for tons of possibilities. Tagged as comic, Comics, con, DC, entertainment, green lantern, green lantern corps, guy gardner, hal jordan, john stewart, justice league, kyle rayner, warner bros.
It’s been rumored for awhile now that Viola Davis was set to play Amanda Waller in the Suicide Squad movie due out next year. At the Academy Awards last weekend Davis officially confirmed that she will be playing Waller in the movie and lead these villains together. This is a good casting; Viola Davis is a great actress and she can pull off a really nice mean side. Although I’ve only caught clips of her recent show, How to Get Away With Murder, she seems pretty dark in that show which will transition perfect to the character of Waller. The Suicide Squad movie seems to be coming together pretty nicely and with this great cast it would be a shame to see it flop. DC has been trying to play major catch up with Marvel in regards to a cinematic universe. Despite only having one film out so far, the company has been doing a great job of putting everything into motion and making tons of big casting reveals. Although some casting choices have seemed questionable at best, a lot of them are very exciting, especially Jason Momoa as Aquaman. It was pretty exciting when they first announced the actor who was Khal Drogo on Game of Thrones would be playing the king of the ocean, and now the first picture is here. Personally, I think Momoa looks amazing and this is a smart and cool take on the character. Aquaman is normally seen with bright green and orange colors while being a white male with blonde hair. Momoa brings a modern rugged look to the character that is way more badass. He really makes Aquaman look like someone you don’t want to mess with and like a true ruler of the entire ocean. 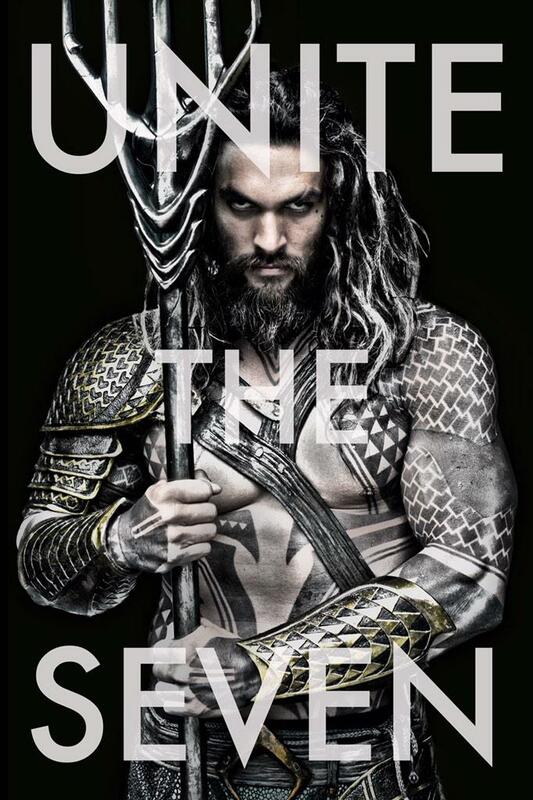 Unite the Seven is probably referring to the seven seas because he is literally the king of all the ocean. It could have some tie to the Justice League if there are going to be seven members, but I would guess this has to do with the solo film. This picture definitely has me interested and excited for Momoa’s Aquaman debut, which sadly won’t be until 2018. Tagged as aquaman, Comics, DC, game of thrones, HBO, jason momoa, justice league, khal drogo, Movie, warner bros. It was disappointing news when Tom Hardy announced that he needed to drop out of DC and Warner Bros.’s Suicide Squad project, but the companies are closing in on officially signing Joel Kinnaman as a replacement. Kinnaman has been really making a name for himself through his standout performance as Stephen Holder on The Killing while also starring in last year’s Robocop reboot. The 35 year old actor has roles in the upcoming Knight of Cups by Terrence Malick, as well as Child 44, which stars Gary Oldman and the man Kinnaman might replace, Tom Hardy. Hardy was supposed to play Rick Flagg, the man that leads the odd group of villains in the Suicide Squad, but dropped out due to scheduling reasons and problems with the script. Kinnaman is one of three in the running to be Hardy’s replacement along with Joel Edgerton and Jon Bernthal. The Suicide Squad movie is currently scheduled for an August 5, 2016 release date and is being directed by David Ayer. The film features Margot Robbie as Harley Quinn, Will Smith as Deadshot, Jared Leto as The Joker, Jai Courtney as Captain Boomerang, and Viola Davis as Amanda Waller.